Serta air mattresses are frequent visitors when it comes to our guides of top-rated in a number of categories (you can see the currently 3 best air beds here). You can just take a peek at the sheer number of Amazon reviews of this blow-up mattress to see how many people bought it and wrote back as happy customers. 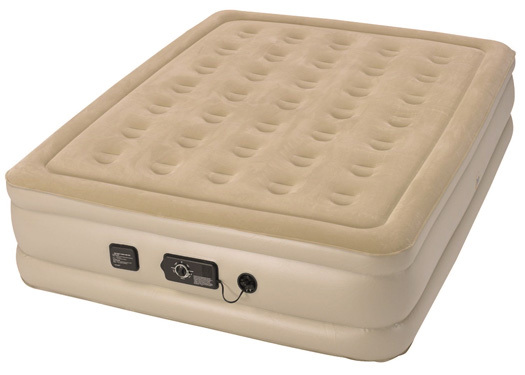 6 What changed since the last review update of this Serta air mattress? Serta inflatable mattresses were one of the first products we wrote about in our guides, and they’ve held their own until today. That has to speak volumes to every smart buyer out there. It holds the Amazon average rating of 4.2 out of almost 1.2k user reviews, which is impressive. Let’s start by doing a side-by-side comparison with the currently top rated airbed – The SoundAsleep Dream Series. Dimensions 18 x 78 x 60 " 19 x 78 x 58"
What changed since the last review update of this Serta air mattress? Unfortunately, Raised Serta got a lower average rating than two months ago, but it’s far from a drastic change to be honest. It simply fell from 80 to 79, which is a marginal change since the last ratings update. it’s one of the few models that holds itw own in a sea of new arrivals that are yet to be battle-tested. It’s an industry classic. As far as fresh INFO goes, we sure have a lot of it! We’ve carefully collected all the user reviews we could find, and we tested the mattress in some pretty interesting ways. Our main point for every air mattress review or ultimate guide is to bring something new and fresh to the table. We discontinued several lines of articles because the topic was too stale and nothing new was happening, EVER! So, if we say we have some fresh, up-to-date info, we sincerely mean it. Now that we know the material we can expect ‘till the end, we can start laying out the foundation for our new Serta update. Finally, you’ll hear our final thoughts on the model, and we’ll say our goodbyes and wish you all the luck in the world during your shopping. Let’s see how this mattress fared against what consumers had to say about it. I’ve been using it as my main bed for little over 2 months now, and I think this is the most comfortable air mattress I’ve ever slept on. I can adjust the firmness just the way I like it, and the secondary pump keeps it in check all night long. Great product! There’s not much we can say about Serta inflatable mattresses we haven’t mentioned already. It remains one of the top value for money product in its price range. Queen-Size raised model is probably their top-selling model with an impressive number of positive consumer reviews on Amazon. Once we see so much customer trust invested in a single product, we know it did our mattress-rating job for us, more or less. So, this air mattress gets very near to your average “REAL” bed experience. The height is right, it’ll never deflate mid sleep, it’s comfortable enough to pull it off, and the support is quite good as well. It holds sheets in place, doesn’t slide all over the room, doesn’t pierce easily and it’s really easy to set up and store away. On the other hand, it’s pretty heavy once inflated, the main pump tends to get loud and some customers said the built-in indentations felt uncomfortable.